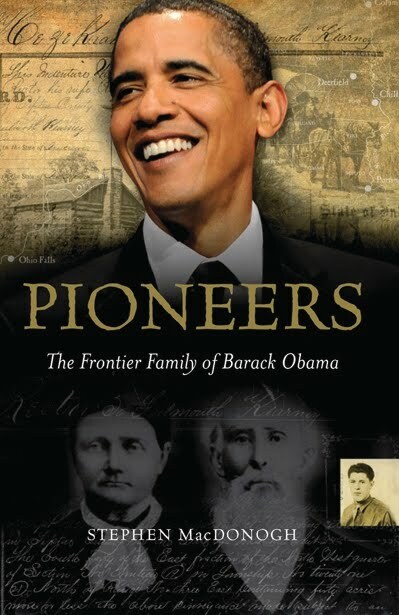 In his book Pioneers: The Frontier Family of Barack Obama, Stephen MacDonogh writes a hypnotic account which pulls readers directly into the tales of wigmakers and pioneers, creating a historical arc of personal and national struggle and triumph which leads to President Barack Obama. The early chapters read like a novel, chronicling the journey of a post-Famine immigrant family, the Kearneys. Sections of Irish history are kept somewhat skeletal, giving the general outline of the conditions of Ireland in the discussed periods, mainly the Famine and immediate post-Famine decades. The focus is sharply kept on the Kearneys and later the Dunhams when marriage in the states begins the cross-cultural ethnic journey that would lead to the first African American president of the United States. Far more personal and character details are presented as the book moves to more recent times, painting an engaging picture of the strong Stanley Ann Dunham, Barack Obama’s mother, who succumbed to cancer in 1995. MacDonogh’s book is a fascinating trip into the genealogical past of a president. He gives life to people centuries gone, making it easy to forget as one reads that this is a story leading up to a political milestone. The pictures throughout the book are the perfect visual component for readers to latch onto as the generations proceed from Offaly to Ohio, from Hawaii to Washington.